The Nigerian military said on Tuesday that it has rescued hundreds of girls and women from Boko Haram territory, bringing some hope that the Chibok schoolgirls who were captured by the extremist group more than one year ago may finally be found and returned home safely. The Nigerian Armed Forces announced the rescue on its official Twitter account, stating that 200 girls and 93 women were found in a remote forest and freed. However, the Nigerian army can not confirm at this time if the Chibok schoolgirls were in this group of girls and women. The girls and women were liberated following an armed forces operation in the Sambisa Forest, located in northeastern Nigeria near where Boko Haram has gained control over the last year. The vast forest covers more than five Nigerian states, including the Boko Haram stronghold of Borno. There, the extremist militant group has orchestrated numerous mass killings and kidnappings, as well as the complete destruction of villages. This latest operation was a strike against the extremist militant group. The Nigerian military said on Twitter that three terrorist camps were destroyed, including the "notorious Tokumbere camp" in the remote forest. Now, the girls and women rescued are being screened by the government. The Nigerian military said it may have more information on their identities in the near future. But whether or not some of these girls may be the missing Chibok girls abducted from their secondary school more than a year ago remains to be seen. 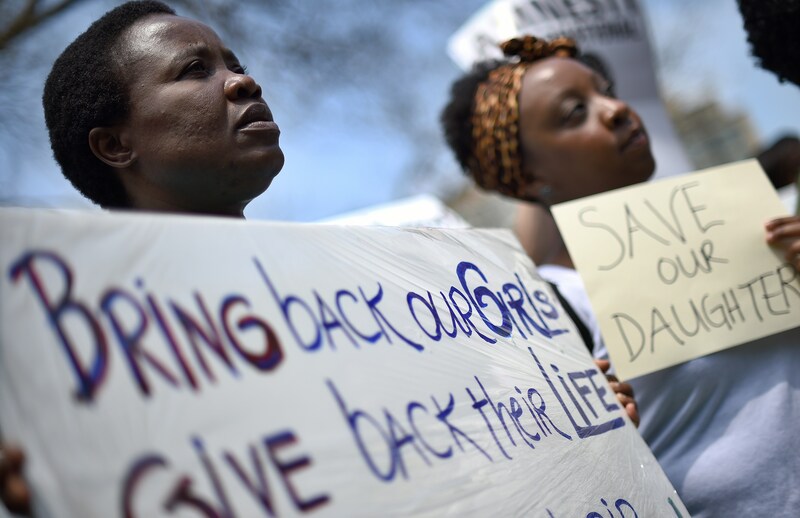 A spokesperson for the Nigerian military told CNN late on Tuesday that the freed girls were "not the Chibok girls." However, some officials are still holding out hope that the missing Chibok girls are in other terrorist camps that have been raided. The Nigerian military also wouldn't confirm on Twitter the whereabouts of the Chibok girls. The abduction of more than 270 schoolgirls by Boko Haram in April 2014 sparked an international movement — Bring Back Our Girls. Although some of the girls have been found over the last year, about 200 of the Chibok girls remain missing.